After the tremendous splash from his “Anthropometric Ball,” the man with the “indisputable thirst for publicity” pushed on. We learn from another non-translated passage in Assouline’s Simenon how it was now “a matter of standing” for Simenon. He gave up ready-made suits for custom clothing. He substituted “an imposing red Chrysler Imperial with Goodyear tires” for his old Citroën. Since “Europe was already apparent as a close suburb of France,” the “great young traveler” hired Yarko, a Slav to double as a chauffeur and deckhand. Often, on parade, Simenon cruised the waters while Yarko drove the riverbank. No wonder his self-promotion and marketing schemes expanded. A radio skit drawn from one of his books angered listeners and provoked a review accusing him of “hijacking radio for his personal promotional profit.” He threw another grand soirée aboard his boat to launch a new sort of novel, a Phototexte that included 104 photographs. The party was much more successful than the book. An “uncompromising defender of his rights,” Simenon took over control of his book covers. In stunt to republish a luxury edition of a book, he bought 3000 pairs of handcuffs to attach as a bonus. That seemed to have bombed. 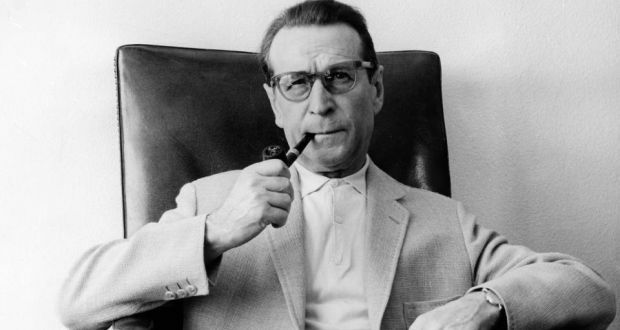 With translations of his novels proliferating in the USA, Britain, Spain, Italy, Norway, Portugal, and Japan, Simenon moved into cinema toward the end of 1931. He saw it “as the quick and easy way to substantially augment his income” even if he didn’t know at the time the great role films would “play in the growth and perpetuation of his works.” The first film, Le Chien jaune (The Yellow Dog), appeared barely one year after the novel hit the bookstores. Next came La Nuit du Carrefour (Night at the Crossroads), but by this time he had already learned “to distrust this medium whose moral standards did not inspire his confidence.” Although movies were his second biggest source of income after his Maigret novels in 1931, Simenon conflicted with the film industry. The problem, as he saw it, was that “when he wrote a book, he was the only master on board.” In contrast, in films, he was “the fifth wheel on the wagon.” After bragging, “Only the author can judge how his novel must be reincarnated,” he announced “the next film drawn from a Simenon book would be produced by himself.” However, his independent efforts to call all the shots and make his own film failed and, even though he subsequently boycotted the industry for seven years, the film world eventually won out.